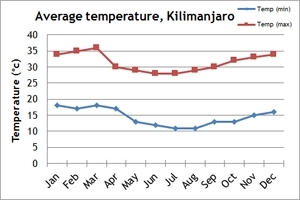 Our temperature and rainfall charts will give you a guide to the climate in Kilimanjaro. It is possible to climb Mount Kilimanjaro at any time of year, however, some months can be a lot colder than others.The two trekking seasons considered to be the best time to climb Mount Kilimanjaro fall between the months of January-March and June-October. January-March is likely to be a colder time to climb, compared to June-October, meaning that there is a bigger chance of finding snow when you reach Kilimanjaro's summit. 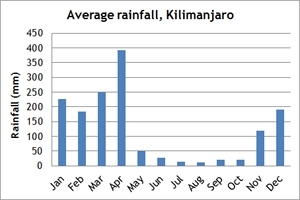 March, April, November and December are considered to be the wettest months in the Kilimanjaro Region.These months are not considered ideal for trekking. There are five different climate zones that you will encounter when ascending Mount Kilimanjaro. Zone one is known as the Cultivated Zone, which you will find between 800m and 1,800m.This zone consists of farmland and is the area of Kilimanjaro that is considered to receive the greatest amount of rainfall each year. Zone two is the Forest Zone, which is located between 1,800m and 2,800m.This zone is inhabited by a vast forest, with huge gorges and is surrounded by some of the tallest trees in Tanzania. Zone three is the Moorland zone. In this zone, the daytime temperature can rise well above 40 degrees however, it can be deceiving as temperatures can drop below 0 degrees during the night. The penultimate zone is known as the Highland Desert Zone.This zone receives an average of 2cm of rainfall per year, and can experience both scorching sunshine and temperatures well below 0 degrees. The final zone is The Summit which sits at the heights of 5,000m-5,895m. It is made up of giant glaciers and blankets of snow – a view serving as the perfect reward of a challenging climb.